Detailed Rajasthani Dal Baati Churma Recipe | Authentic Dal Bati Churma Recipe Video (दाल बाटी चूरमा) recipe with step by step video tutorial. 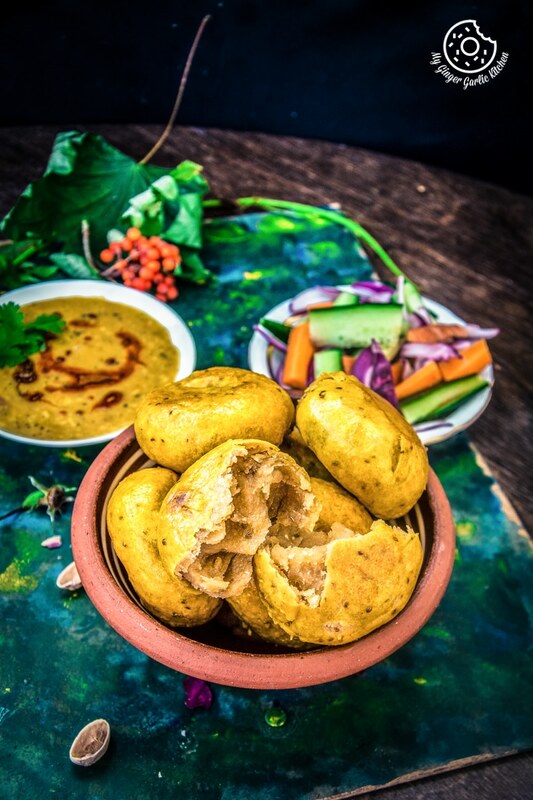 Dal Baati Churma is the most popular dish of Rajasthani cuisine. This meal is an esteemed part of every Rajasthani household. 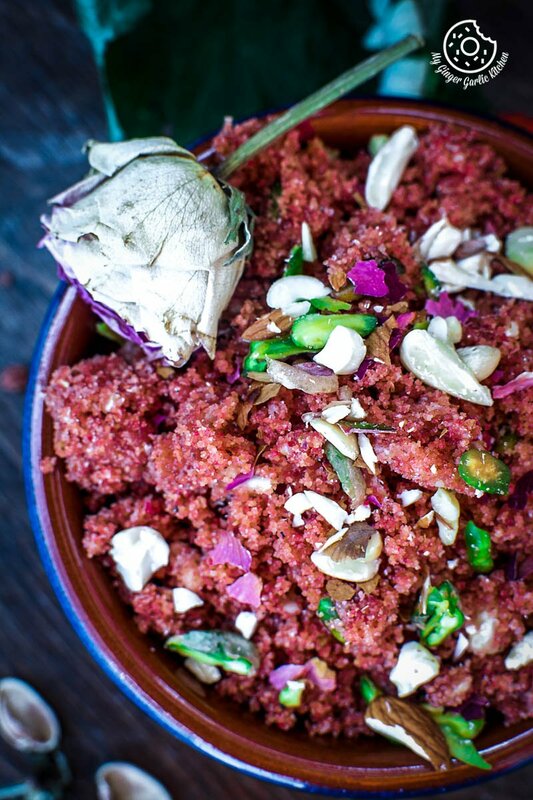 This 3 in1 delicacy is a typical Rajasthani treat. A platter of sweet Churma, spicy Dal and Baati, is one such traditional combination. Rajasthani Dal Baati Churma Recipe | Authentic Dal Bati Churma are the names of the recipes I am sharing today. Dal Baati Churma are 3 dishes in one meal. If you have been reading my blog for a long time, then you might already know that I come from Jaipur. The capital city of the Indian state of Rajasthan. ‘Rajasthan’ literally means “Land of Kings”. When it comes to authentic Rajasthani food, then the first thing which comes to everybody’s mind is definitely ‘Dal Baati Churma’. However, this is not the only dish that would come to your mind. There is an endless list of delicious Royal foods like Malai Ghevar, Besan Gatte Ki Sabzi, Mishri Mawa, Pyaaz Ki Kachori, Mawa Malpua, Khooba Roti, Mawa Kachori, and so on. Jaipur is a heaven for a foodie with choices of so many Royal Rajasthani delicacies. And this ‘Dal Baati Churma’ is the king of Rajasthani food. 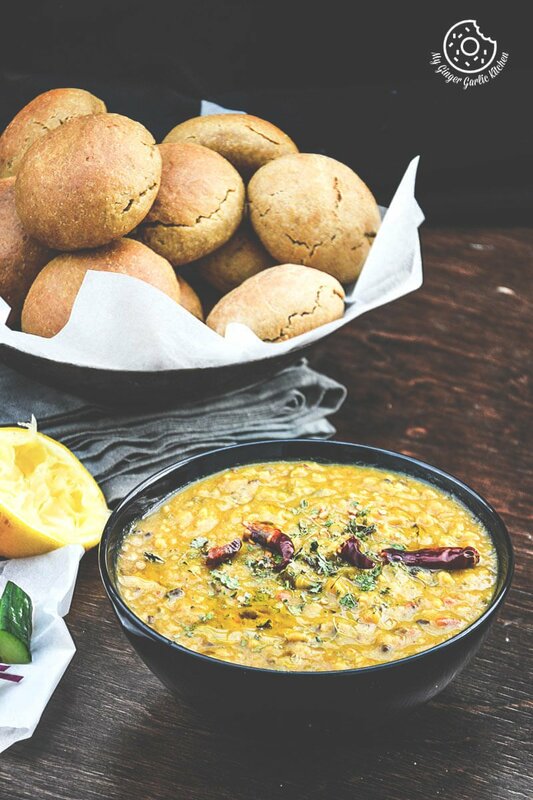 Rajasthani Dal Baati Churma Recipe is the most popular dish of Rajasthani cuisine. This meal is an esteemed part of every Rajasthani household. This 3 in1 delicacy is a typical Rajasthani treat. But you might be wondering what actually is this ‘Dal Baati Churma’? The people of Rajasthan specialize in serving sweet and savory dishes in combinations that steal the heart and delight the taste buds. A platter of sweet Churma, spicy Dal and Baati, is one such traditional combination. 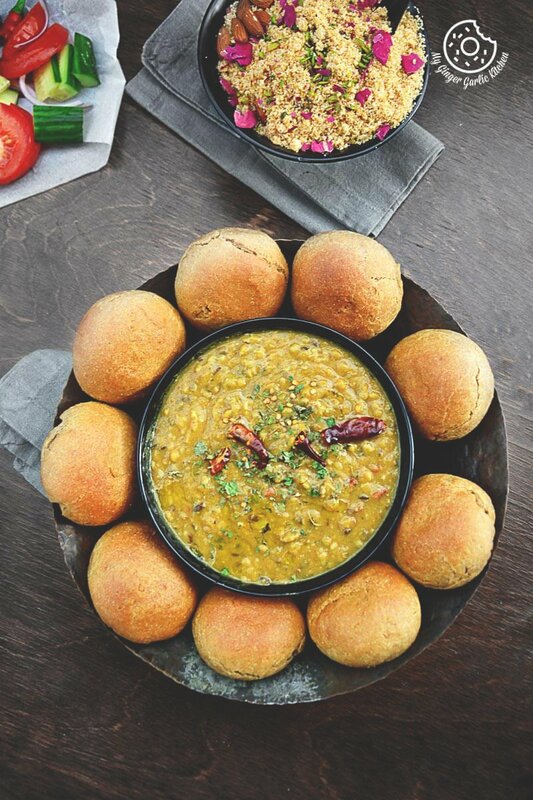 Fresh baatis dipped in piping hot dal is a perfect accompaniment for churma. This combo of ‘Dal Baati Churma’ is a wonderful way to warm yourself up on a cold day! 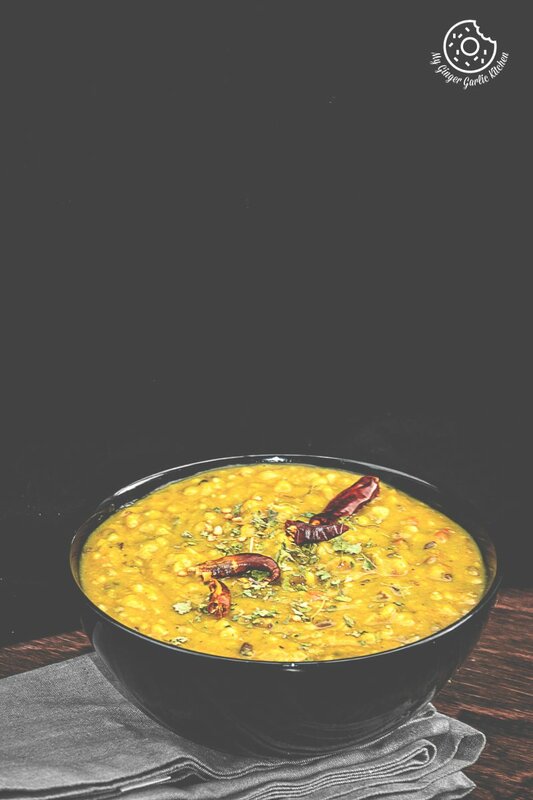 Dal (lentil) is a spicy side dish made of lentils and tempered with spicy tadka. 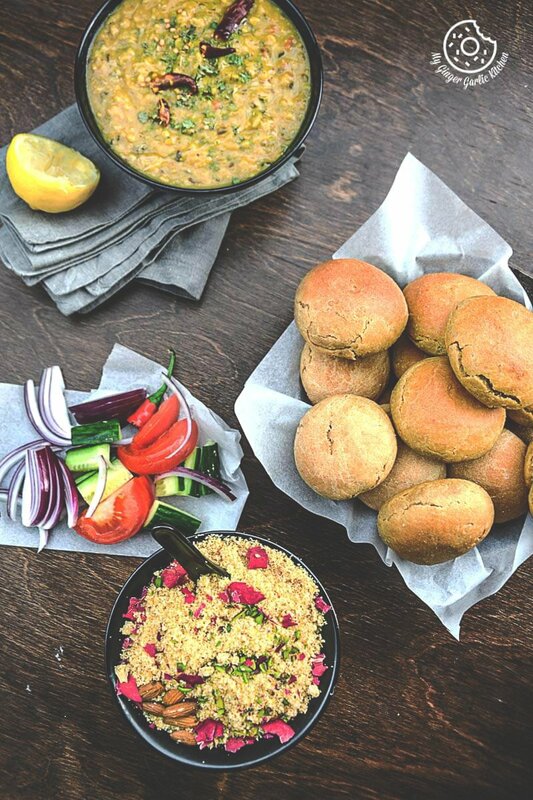 Baatis are fried or baked dough dumplings of wheat and semolina. Baatis have so many versions; plain, masala (stuffed), missi, Bafla Bati, dry fruit baati, and many more. The basic baati is made out of wheat flour and semolina. 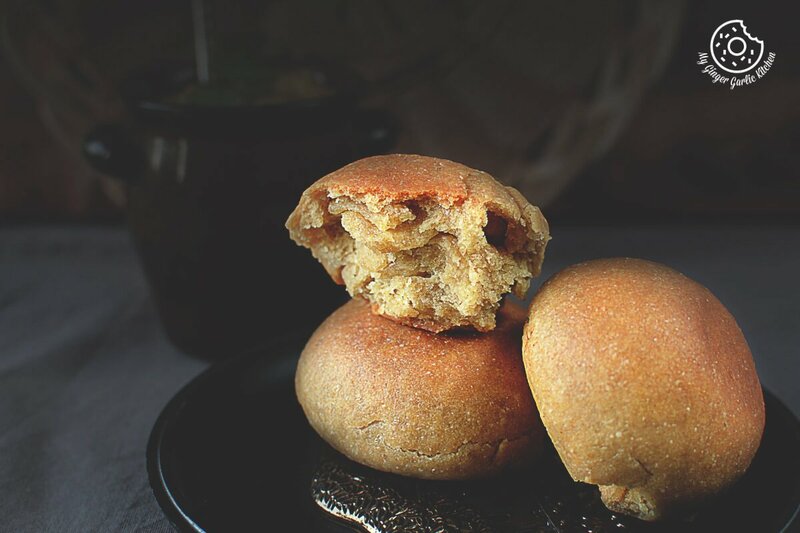 Baati can also be made with millet, barley flour, a mix of wheat flour and corn. Churma: There are so many varieties of the churma depending upon the ingredients used. A basic Churma is a sweet stuff made of whole wheat and semolina. And there are many more flavors of churma. Besan (gram-flour) Churma, Rose Churma, Bajre (pearl millet) Churma and some more. The only key to making this dish more and more delicious is the addition of ghee (clarified butter). 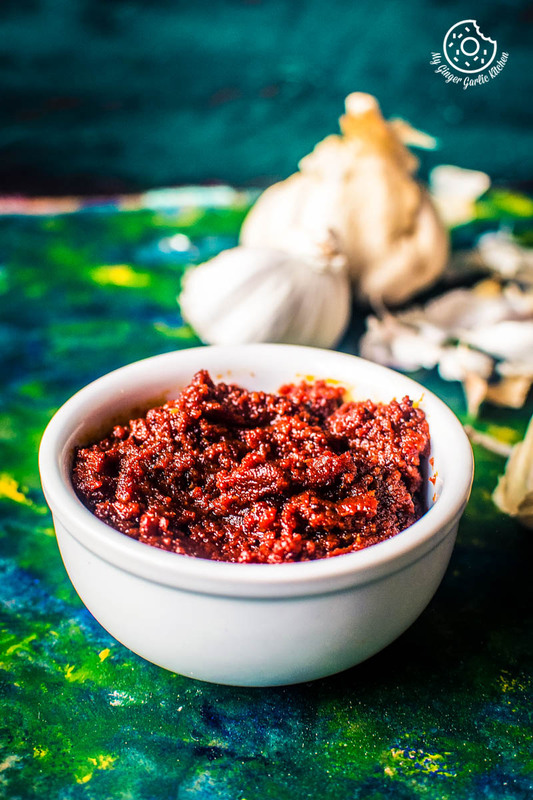 The more ghee you use in these 3 dishes, the more scrumptious they would come out. I seriously mean lots and lots of ghee. 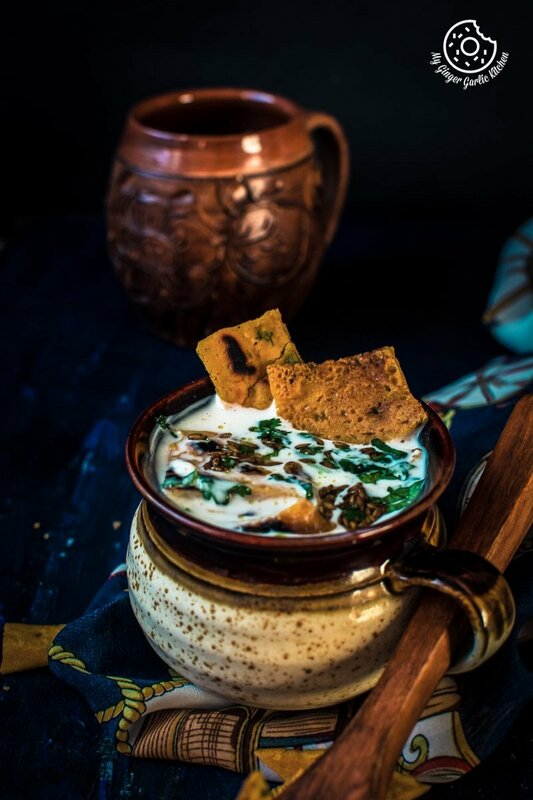 ‘Dal Bati Churma’ is the renowned delicacy of the Rajasthani cuisine. There are no festivals, weddings or parties which are complete without the serving of the ‘Dal Baati Churma’. 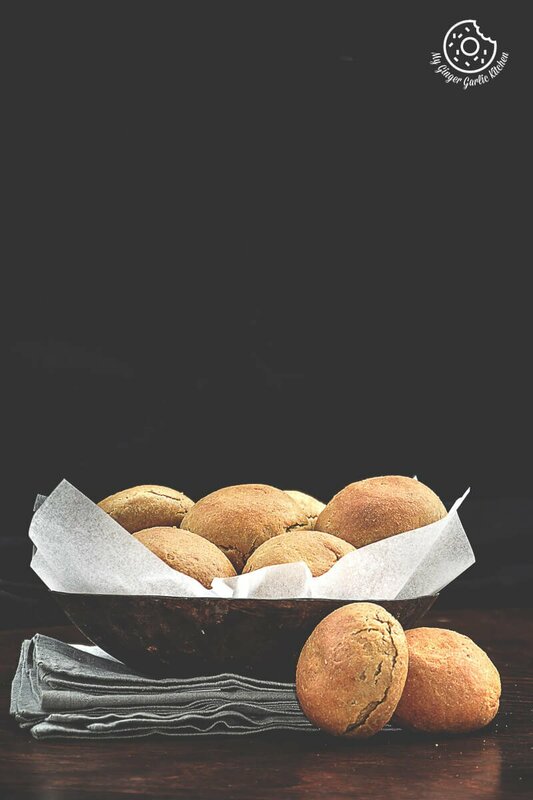 It is difficult to ascertain the origin of ‘Dal Baati Churma’, but many believe that the history of the ‘Dal Baati Churma’ lies in the Mewar culture. As Rajasthan is the land of Kings. So the war-like lifestyle of the Rajputanas gave birth to this humble meal ‘Dal Baati Churma’. There was the need for a long-lasting food at the times of war when the armies faced a lot of adverse conditions. Making ‘Dal Baati’ was a good choice, as it could be cooked fast and in a huge quantity, which met the requirements of the entire army. Some say this was the reason for the advent of ‘Dal Baati Churma’. So the addition of Ghee made this dish even more energetic and rich so that the tired soldiers could replenish very fast. Another reason for considering ‘Dal Baati Churma’ as a suitable food was the Rajasthan’s barren land and insufficient water. The idea was to bake wheat dough dumplings in bulk so that the people can eat them for many days to come. Here is a little secret; I never loved eating ‘Dal Baati Churma’ as a child. This was the last thing I wanted to eat back then. Why didn’t I like this meal? The only reason for not eating ‘Dal Baati Churma’ was the ‘Ghee’. Yes, I never liked the dishes made with ghee. I just couldn’t stand the caramelly aroma. I know it might sound weird but it is true. So that’s why I never ate most of the Indian sweets because they were all made with ghee. My mom tried everything to make me eat dishes made with ghee, but all in vain. Every time, she made ‘Dal Baati Churma’ for the family, I always opted for Dal-chawal (steamed rice + lentils). Mom: Would you eat ‘Dal Baati’ if I make a variation? Mom: See, you eat everything made with oil, but not with ghee. Like you eat paratha roasted in oil but not in ghee. Me: Yes! But what’s the connection here? Mom: Look, I will make baati, and instead of dipping them in ghee I will brush them with oil. How does that sound to you? Would you like to give it a try? Me: Mmmm, I can try, but only on one condition. Me: I will taste first, and if I don’t like it I would never eat that ever again. And you would not pressure me to do that. Deal? Then My mom made Baati and brushed that with oil. And without telling me, she added extra ghee to the dough to make sure baatis don’t turn out to be rock hard. I tasted that baati and that day I liked it, and I ate one baati. That was a win for my mom. For many years it went like this, and Mom never told me that she also used ghee in my baati. During the time I lived with my parents, I was always a fussy eater. But time changes everything. I don’t know how and when I started liking dishes made with ghee. But eventually, it happened. Now I love to eat dishes made with ghee. And I love the aroma of ghee too. Now whenever I tell Mom that I finally started eating ghee, she doesn’t believe it. And she makes sure to make one meal of ‘Dal Baati Churma’ for me whenever I visit her. She says that she just loves watching me eat dishes I never ate my whole life. I would have found this a bit strange earlier, but not now. Now I know how it feels when your child is a fussy eater. I feel for my Mom now. I feel her pain, and now I make sure to give her that satisfaction she has been craving for all these years. Moms are always Moms. No matter how old we grow, we would still be the little children for our Moms. I am a die hard fan of ‘Dal Baati Churma’ now. Now you know that I eat ghee, but the only thing why I don’t add ghee to my dishes is that I am bit calorie conscious. So I always try to find a substitute for ghee. But for ‘Dal Baati Churma’ there is actually no substitute. You can surely add less ghee but cannot really omit it completely. I think not adding Ghee would be an insult of this royal dish. And then it won’t be called ‘Dal Baati Churma’. We don’t eat these heavy, rich and classic dishes on a daily basis, so once in a while they are just fine. Today I am sharing only 3 dishes of ‘Dal Baati Churma’ platter. But the ‘Dal Baati Churma thali (platter) looks something like this. Sharing all these dishes at once would be an overkill, and the single post wouldn’t do justice to this large meal. But I will share all these dishes with you, one by one may be. 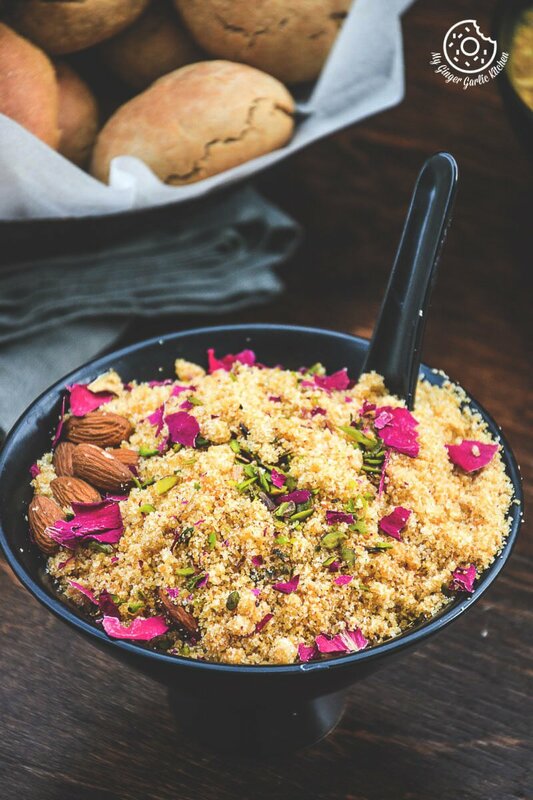 Combine the whole wheat flour, semolina and melted ghee in a deep bowl and mix well. Add about ¼ cup of water and knead well to make a stiff dough. Divide the dough into 10 equal small balls. The shape we are making is called muthias. Now take a dough ball in your palm and shape in the shape of your fist and press with your fingers in the center of each portion as shown in the picture above. Heat the oil and fry the muthias at low heat until they are golden brown in color from all the sides. Frying muthias will take a long time. Drain on an absorbent paper and allow them to cool. Grind the fried dough shapes in a blender into a fine powder. Pass it through the sieve to get a fine mixture. Grind the solid pieces again and pass it through the sieve again. You may need to follow this step for a couple of times to get the perfect texture. Add melted ghee, almonds, almonds, cardamom powder, and powdered sugar and mix well and set aside. Chruma is ready. Wash all the dals, and add to a pressure cooker. Add salt and 5 cups of water, turmeric powder and mix well. Pressure cook for 4-5 whistles. Allow the steam to escape before opening the lid. Heat the oil/ghee in a pan. Add the cloves, dried red chili, green cardamom, black cardamom, bay leaf, cinnamon stick, cumin seeds and asafetida. Sauté for a few seconds. When the seeds crackle, add onion and chopped chilies. Saute for 3 minutes. Add the tomatoes and ginger garlic paste. Saute for 2-3 minutes. Now add coriander powder, turmeric powder, chilli powder and garam masala along with 3 tbsp of water and mix well. Add some more salt, if needed. Cook on a medium flame for 3-4 minutes. Stir occasionally. Add this tempering to the cooked dal and mix well. Cook on a medium flame for 2 to 3 minutes. Remove from heat. Add lemon juice and mix well. Keep aside. Dal is ready. Preheat oven at 175°C/ 350. Add wheat flour, semolina, ghee, salt and baking to a large mixing bowl. Mix well and add yogurt to it. Mix well to knead into a semi-stiff dough. Use 2-3 tbsp or more warm water, if needed. Divide the dough into 10-12 equal portions and shape each portion into a ball. Flatten the ball, make a small indentation in the center of the dough balls using your thumb. Keep aside. Arrange baatis in a baking tray. Bake for 30-40 mins or until they top turn golden brown. Use a kitchen towel and press hot baati slightly with your palm. Don’t press it so hard, we just want to crack them slightly. Soak cracked baatis in ghee for few seconds, and drain on an absorbent paper. Keep aside. Baatis are ready. Dal Baati Churma is the most popular dish of Rajasthani cuisine. This meal is an esteemed part of every Rajasthani household. This 3 in1 delicacy is a typical Rajasthani treat. A platter of sweet Churma, spicy Dal and Baati, is one such traditional combination. 1. 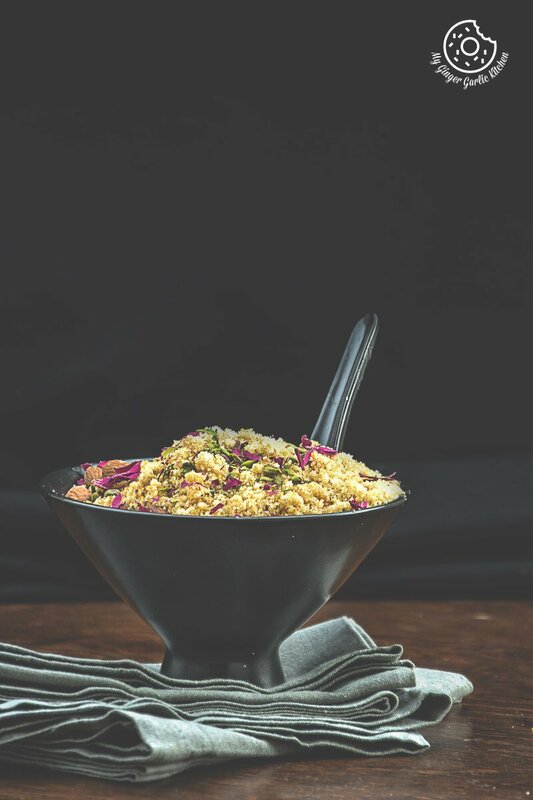 Combine the whole wheat flour, semolina and melted ghee in a deep bowl and mix well. 2. Add about ¼ cup of water and knead well to make a stiff dough. 3. Divide the dough into 10 equal small balls. 4. The shape we are making is called muthias. 5. Now take a dough ball in your palm and shape into the shape of your fist and press with your fingers in the center of each portion as shown in the video or in the picture above. 6. Heat the oil and fry the muthias at low heat until they are golden brown in color from all the sides. 7. Frying muthias at low heat will take some time. 8. Drain on an absorbent paper and allow them to cool. 9. Grind the fried dough shapes in a blender into a fine powder. 10. Pass it through the sieve to get a fine mixture. 11. Grind the solid pieces again and pass it through the sieve again. 12. You may need to follow this step for a couple of times to get the perfect texture. 13. Add melted ghee, almonds, almonds, cardamom powder and powdered sugar and mix well and set aside. Chruma is ready. 1. Wash all the dals, and add to a pressure cooker. Add salt and 5 cups of water, turmeric powder and mix well. Pressure cook for 4-5 whistles. 3. Heat the oil/ghee in a pan. Add the cloves, dried red chili, green cardamom, black cardamom, bay leaf, cinnamon stick, cumin seeds, and asafetida. Sauté for a few seconds. 4. When the seeds crackle, add onion and chopped chilies. Saute for 3 minutes. 5. Add the tomatoes and ginger garlic paste. Saute for 2-3 minutes. 6. Now add coriander powder, turmeric powder, chili, and garam masala along with 3 tbsp of water and mix well. 7. Add some more salt, if needed. 8. Cook on a medium flame for 3-4 minutes. Stir occasionally. 9. Add this tempering to the cooked dal and mix well. 10. Cook on a medium flame for 2 to 3 minutes. 11. Remove from heat. Add lemon juice and mix well. 12. Keep aside. Dal is ready. 1. Preheat oven to 175°C/ 350. Add wheat flour, semolina, ghee, salt and baking powder to a large mixing bowl. 2. Mix well and add yogurt to it. Mix well to knead into a semi-stiff dough. 3. Use 5-6 tbsp or more warm water, if needed. 4. Divide the dough into 10-12 equal portions and shape each portion into a ball. 5. Flatten the ball, make a small indentation in the center of the dough balls using your thumb. Keep aside. 6. Arrange baatis in a baking tray. 7. Bake for 30-40 mins or until the top turn golden brown. 8. Use a kitchen towel and press hot slightly with your palm. 9. Don’t press it so hard, we just want to crack them slightly. 10. Soak cracked in ghee for a few seconds, and drain on an absorbent paper. 11. Keep aside. Baatis are ready. 1. Pour ghee over hot dal. 2. Pour some ghee over baati and churma. 3. Serve hot with red chutney, onions, lemon wedges.